This is a good carb loaded recipe perfect for a cold winter’s dinner and quirky enough to satisfy your favorite Aquarian. Aquarians are the rebels of the Zodiac. They love to innovate and just shake up the normal flow of life. Often described as the teenagers of the sky, Aquarians have a low tolerance for the mundane. In my cookbook, “Signs of the Tines: The Ultimate Astrological Cookbook” www.signsofthetines.com, I include this fried pasta recipe in the Aquarius section because it appeals to their sense of the different. Anyone can boil or bake pasta but it takes an Aquarian to fry it. In a large pot, add 3 quarts of water and salt and bring to a boil over high heat. Add the spaghetti and reduce the heat to medium. Cook, stirring often about 8 -10 minutes until al dente. While the pasta is cooking, heat the olive oil in a large sauté pan over medium heat. Add the garlic and cook until it just begins to brown. Stir in the red pepper flakes. When the spaghetti is cooked, drain well and pour into the pan. Stir in the best, being sure to coat the spaghetti well. Lower the heat and cook the spaghetti for 4 minutes, flip it over and cook on the other side for 4 minutes. 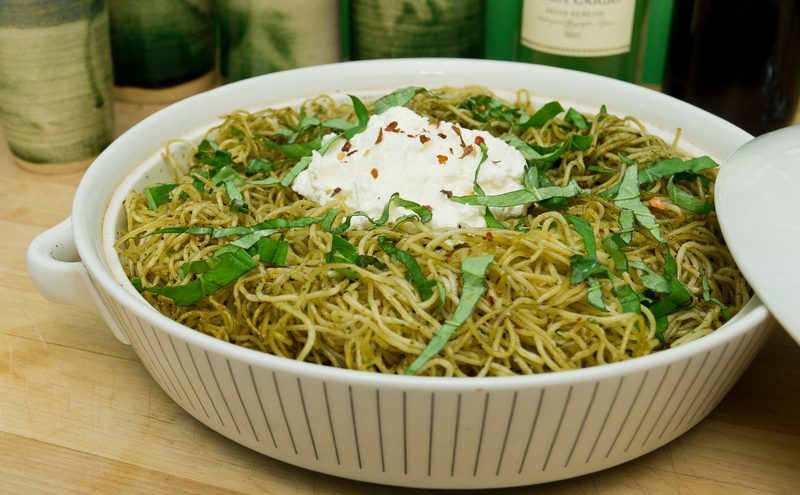 Turn the spaghetti into a platter, dollop the ricotta cheese on top and decorate with the basil. *You can purchase basil pesto or make it by mixing 1 cup fresh basil leaves, 2 tablespoons pine nuts (or walnuts or no nuts if you don’t like them), 2 tablespoons for freshly grated Parmigiano-Reggiano cheese in a food processor. Start the processor and slowly pour in 1 cup of extra-virgin olive oil. Keep processing until the mixture is very fine.